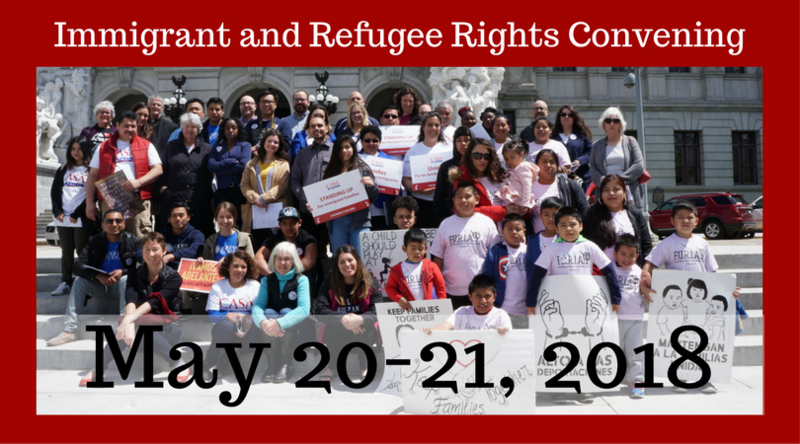 Last Day to Register for the Convening! We have extended the registration deadline through the end of today to make sure everyone is able to attend. Register Today. We look forward to seeing you on Sunday! Continuing its attacks on immigrant communities, Attorney General Jeff Sessions recently announced an expansion of the administration's "zero tolerance" policy for anyone crossing the US-Mexico border without inspection. While in the past the charge of illegal entry was often charged as a civil offense, AG Sessions said that going forward, the goal is for "100 percent" of those crossing the border without inspection be charged with "improper entry by an alien" and face a prison sentence. He also stated that anyone caught crossing with a child, even their own child, would be prosecuted for smuggling. AG Sessions also announced that even those who are able to begin the legal process of applying for asylum will be referred to the DOJ to be prosecuted criminally while their asylum case is pending. These changes mean that children will be taken from their parents while they are in court proceedings, placed in federal juvenile centers, and in some cases, placed in kinship foster care. 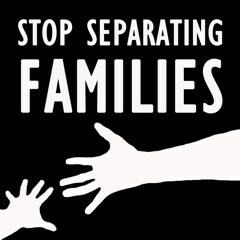 This increased targeting of immigrant families is a continuation of the current practice of jailing families seeking asylum. Whether the administration put families in jail, or separates them at the border, they are needlessly harming children and families. 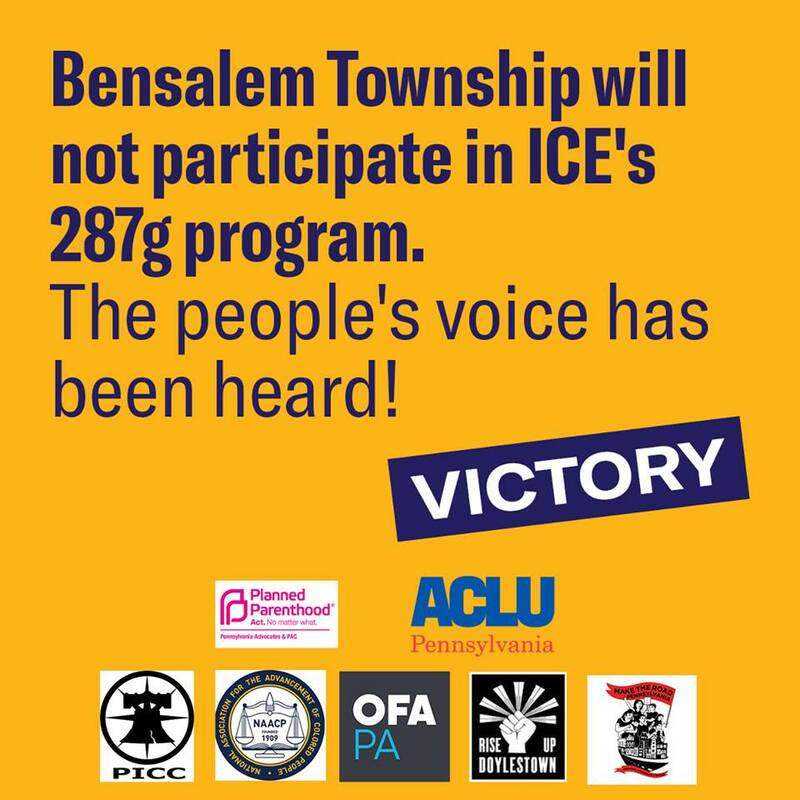 Last year, residents of Bensalem learned that the local Public Safety Director was actively interested in participating in the Immigration and Customs Enforcement(ICE) 287g program, in which ICE partners with state or local police agencies that agree to help enforce immigration laws within their jurisdictions. Local community members and activists immediately mobilized, attending town council meetings, writing letters, and meeting with local Mayor and Public Safety Director. Just a few weeks ago, both officials committed that they would no longer pursue participation in 287g. So far, no jurisdication in Pennsylvania has signed up for 287g, and PICC members and partners are committed to keeping it that way! What should you do if you are concerned about whether your local law enforcement agency is collaborating with ICE? 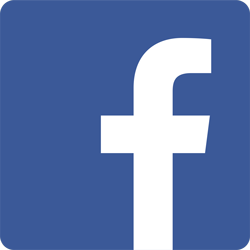 Download PICC's "Ally’s Guide to Sanctuary." This toolkit will help you learn more about what it means to advocate for sanctuary policies and explore its historical meaning and current forms, along with providing helpful resources to implement or strengthen pro-immigrant policies in your community. Eligibility/ Eligibilidad: Applicant must be US citizen or Lawful Permanent Resident. El aplicante tiene que ser cuidadano americano o residente permanente. Please RSVP by calling (215) 634-7245/ Por favor haga una cita llamando al (215) 634-7245. Join activists from around the state who are working to stop all anti-immigrant legislation in PA and to pass pro-immigrant policies at the municipal and state levels. Every call we will have an in-depth presentation on a different topic or campaign. Please register to receive the information to join the calls. Join us via webinar to get prepared for your lobby visit to Governor’s Wolf office. He needs to hear from constituents that 2018 is the year he issues an Emergency Removal Order to ensure no new families are brought to the Berks County Detention Center. This training will review the history of the center, how to lobby and the research that proves that the state of Pennsylvania can in fact issue an Emergency Removal Order. Please register today! The Poor People's Campaign has emerged from more than a decade of work by grassroots community and religious leaders, organizations and movements across the nation. We are united together to fight systemic racism, systemic poverty, ecological devastation and the war economy, and to shift the nation’s distorted moral narrative. The Campaign aims to build a broad and deep moral movement – rooted in the leadership of poor people and moral leaders, and reflecting our deepest constitutional and faith traditions – to put before the nation a moral agenda. Join the Campaign in Harrisburg, PA for a rally and nonviolent moral resistance as part of the Poor Peoples Campaign: A National Call for Moral Revival. The second week's theme is "Linking Systemic Racism and Poverty: Voting Rights and Immigration." If you qualify, we will fill out the waiver as well. For more information, contact Brenda Sólkez at (412) 980-4151 or bsolkez@cjplaw.org. Call, text, WhatsApp or email.